Why have one court for only one sport when you can play multiple sports on the same court?! By simply altering the court layout, line configuration, and adding a few components, your space for a basketball court can be turned into a space for a multi-sport activity center! A half basketball court can be modified to accommodate volleyball, pickleball, badminton, short court tennis, tennis practice, and soccer, by merely adding a net post with a net and a 10×20 rebounder. If you want to add lines for another sport, just let DeShayes Dream Courts know and we will accommodate as best as possible. 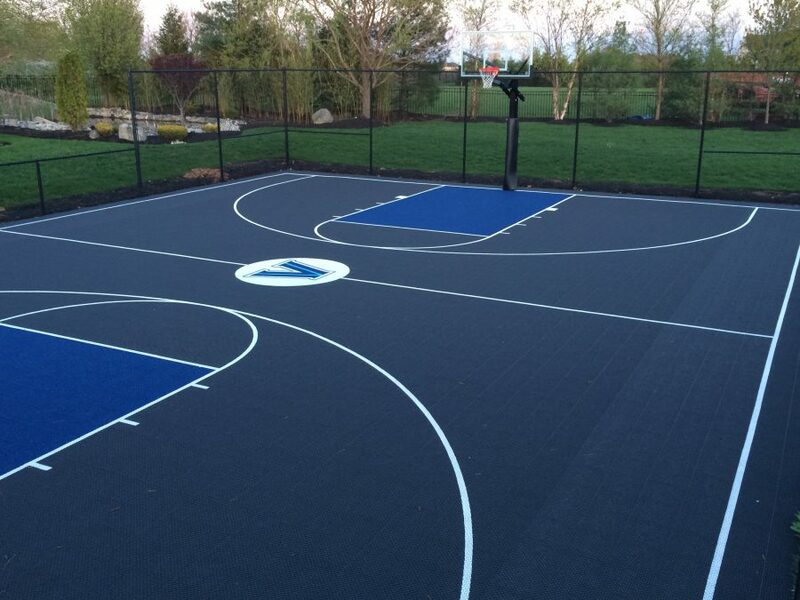 There are ample benefits to having a DeShayes multi-sport court installed at your home. First and foremost, more people can enjoy more sports on the same court. No need to worry that your child will lose interest in basketball after investing in a court because the court will be good for many other sports as well! This is also a benefit when it comes to space. One kid loves volleyball, another loves soccer and basketball, and the other loves all three? No worries! You can have it all on one DeShayes multi-sport court. Playing different sports all year sharpens your motor skills and is a great way to avoid the burn out associated with constantly playing the same sport. Having a multi-sport court also aids in minimizing repetitive motion injuries by incorporating different sports. Give your kids the home-court advantage and call DeShayes Dream Courts for your multi-sport court today! Full court basketball court that can accommodate two half-court basketball games (20 people), a batting cage for baseball and/or softball practice (2 people), and a 60’x30’ turf field for soccer and/or lacrosse practice (up to 10 people). This court also has net posts and volleyball lines so you can easily put up a net and play volleyball when you aren’t playing basketball. Originally, this was a 7,200 square foot regulation size tennis court. That is the size of a 14,400 square foot home. This is a huge area for only two to four people to play one sport. The homeowner where the above court is located has four active, athletic children, none of whom had an interest in tennis. When he contacted DeShayes Dream Courts unsure of how to make use of all of the space, Joe DeShayes knew this would be the perfect opportunity to convert his tennis court into a multi-use court. 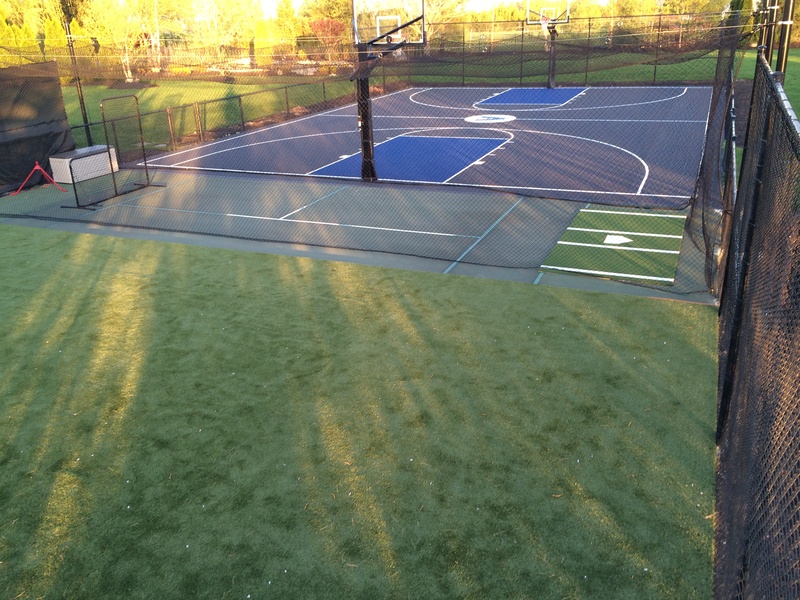 DeShayes converted this court to a full court basketball court that can accommodate two half-court basketball games (20 people), a batting cage for baseball and/or softball practice (2 people), and a 60’x30’ turf field for soccer and/or lacrosse practice (up to 10 people). This court also has net posts and volleyball lines so you can easily put up a net and play volleyball when you aren’t playing basketball. That is 6 different sports you can play on one surface (3 sports at a time) and up to 32 people on the court at one time, all playing a sport! That is a major increase from the one sport and four people that the tennis court could accommodate! Multi-use courts are the best return on investment. With options for different sports to play, children become more well-rounded athletes and avoid the one sport burn out & repetitive motion injuries that are all too common amongst young athletes that focus all of their time and energy on one sport. An added benefit to these multi-use courts that many parents don’t consider is that once you build it, all of the neighborhood kids will come to your home. 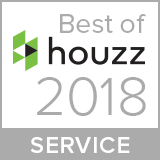 Your court will be the home court for your children and all of their friends, and you will have the comfort and security of knowing where your children are and who they are with. 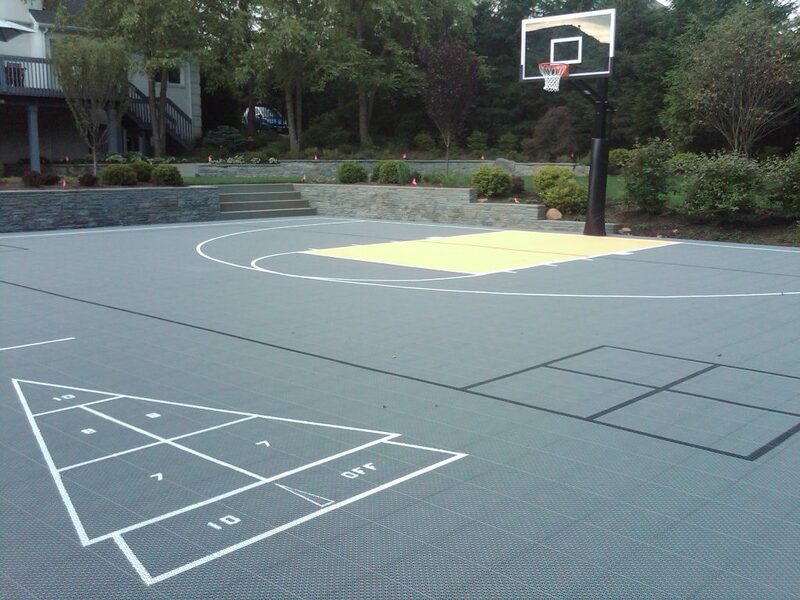 Call DeShayes Dream Courts today and let us design and install your very own multi-use court!